Toenail Fungus Treatment Clinic. Dr. Kourosh Harounian's Foot Clinic is a specialized foot care center that utilizes the most up-to-date and the most efficient technology(s) available in the market today for the treatment of foot and ankle pathology. Dr. Harounian is a licensed podiatrist and is certified to treat Toenail Fungus using the Pin Point foot Laser. Currently in our clinic we use the first ever FDA cleared laser machine for the treatment of toenail fungus. What is Toenail Fungus ( Onychomycosis )? Toenail Fungus is a common nail infection that can cause the toenails to thicken and take on a yellowish or cloudy appearance. The nails can become rough and crumbly, or can even separate from the nail bed. Generally, there is no pain or physical symptoms, unless the disease has progressed to a severe stage of development. Treatment of onychomycosis ( Toenail Fungus ) is challenging because the infection occurs deep within the nail bed and is difficult to reach. As far as the available treatments, one can use over-the-counter antifungal creams & ointments , which are proven to be the least effective method, since they work only superficially. Prescription medication can also be used to treat Toenail Fungus . These drugs are usually taken orally. They have frequently been associated with both a long list of side effects and liver toxicity. They are also rather pricey. A normal course of oral treatment for Toenail Fungus infection is 12 weeks. Traditional drug-based Toenail Fungus treatment is relatively ineffective, and repeated Toenail Fungus reinfection is also common. We are proud to say that Pin Pointe Foot Laser is now being used in our office to eliminate Toenail Fungus once and for all. The state-of-the art Pin Pointe Foot Laser technology has been designed specifically for the treatment of Toenail Fungus . This technology is the result of 20 years of research by a team of scientists and medical professionals. No Toxic Medication thus No Side Effects. Our Clinics in downtown Los Angeles and in West Los Angeles, are fully equipped with all the necessary tools and requirements for treating Toenail Fungus infection by laser. The treatment usually takes no longer than an hour and most Toenail Fungus infections are treated in one session. For more information about Toenail Fungus laser treatment and Pin Pointe Laser Technology, check our Cutting Edge Fungus Nail Treatment Page. Our clinics now offer state-of-the-art Pin Pointe Foot Laser treatment. What is Pinpointe Foot Laser? Will I be able to walk after the procedure? Is Toenail Fungus laser treatment covered by my medical insurance? 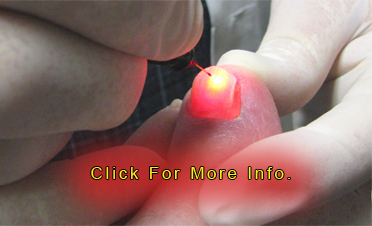 Pin Pointe Laser is the most recent and advanced method for Toenail Fungus Treatment. If you or someone you know is suffering from Toenail Fungus infection or other problems related to foot & ankle please contact our office for an appointment. Tel. 213-484-0040 (Metropolitan Los Angeles) or Tel. 310-477-9210 (West Los Angeles). For more information about Toenail Fungus laser treatment, check out our Cutting Edge Fungus Nail Treatment Page.